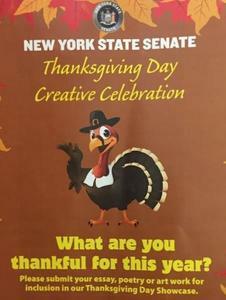 NEW YORK STATE SENATE SPONSORS THANKSGIVING DAY CREATIVE CELEBRATION! To celebrate Thanksgiving Day this year, the NY State Senate is sponsoring a Creative Celebration for children in grades K-6. The theme of the Thanksgiving Day Celebration is “What are you thankful for?” Participating students will submit electronically, preferably in jpeg or pdf format via www.latimer.nysenate.gov, an original poem, one-page essay, or artwork expressing what they are thankful for in the past year. Students are encouraged to not only be creative in their projects, but also to convey being thankful for the people in their lives and their communities. All submissions will be published online, and students will receive a certificate from their Senate acknowledging their participation. Deadline for student submissions is November 20, 2017.